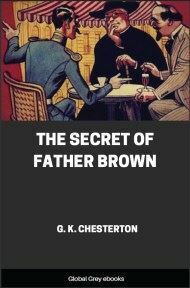 The fourth book in the Father Brown series, this contains 10 short stories: The Secret of Father Brown; The Mirror of the Magistrate; The Man With Two Beards; The Song of the Flying Fish; The Actor and the Alibi; The Vanishing of Vaudrey; The Worst Crime in the World; The Red Moon of Meru; The Chief Mourner of Marne; and, The Secret of Flambeau. FLAMBEAU, once the most famous criminal in France and later a very private detective in England, had long retired from both professions. Some say a career of crime had left him with too many scruples for a career of detection. Anyhow, after a life of romantic escapes and tricks of evasion, he had ended at what some might consider an appropriate address: in a castle in Spain. The castle, however, was solid though relatively small; and the black vineyard and green stripes of kitchen garden covered a respectable square on the brown hillside. For Flambeau, after all his violent adventures, still possessed what is possessed by so many Latins, what is absent (for instance) in so many Americans, the energy to retire. It can be seen in many a large hotel-proprietor whose one ambition is to be a small peasant. It can be seen in many a French provincial shopkeeper, who pauses at the moment when he might develop into a detestable millionaire and buy a street of shops, to fall back quietly and comfortably on domesticity and dominoes. Flambeau had casually and almost abruptly fallen in love with a Spanish Lady, married and brought up a large family on a Spanish estate, without displaying any apparent desire to stray again beyond its borders. But on one particular morning he was observed by his family to be unusually restless and excited; and he outran the little boys and descended the greater part of the long mountain slope to meet the visitor who was coming across the valley; even when the visitor was still a black dot in the distance. The black dot gradually increased in size without very much altering in the shape; for it continued, roughly speaking, to be both round and black. 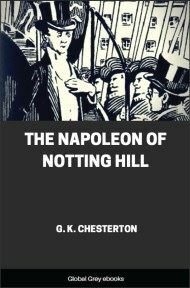 The black clothes of clerics were not unknown upon those hills; but these clothes, however clerical, had about them something at once commonplace and yet almost jaunty in comparison with the cassock or soutane, and marked the wearer as a man from the northwestern islands, as clearly as if he had been labelled Clapham Junction. He carried a short thick umbrella with a knob like a club, at the sight of which his Latin friend almost shed tears of sentiment; for it had figured in many adventures that they shared long ago. For this was the Frenchman’s English friend, Father Brown, paying a long-desired but long-delayed visit. They had corresponded constantly, but they had not met for years. Father Brown was soon established in the family circle, which was quite large enough to give the general sense of company or a community. He was introduced to the big wooden images of the Three Kings, of painted and gilded wood, who bring the gifts to the children at Christmas; for Spain is a country where the affairs of the children bulk large in the life of the home. He was introduced to the dog and the cat and the live-stock on the farm. But he was also, as it happened, introduced to one neighbour who, like himself, had brought into that valley the garb and manners of distant lands. It was on the third night of the priest’s stay at the little chateau that he beheld a stately stranger who paid his respects to the Spanish household with bows that no Spanish grandee could emulate. He was a tall, thin grey-haired and very handsome gentleman, and his hands, cuffs and cuff-links had something overpowering in their polish. But his long face had nothing of that languor which is associated with long cuffs and manicuring in the caricatures of our own country. 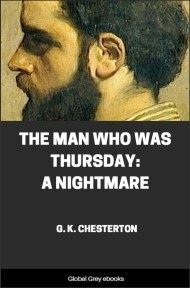 It was rather arrestingly alert and keen; and the eyes had an innocent intensity of inquiry that does not go often with grey hairs. That alone might have marked the man’s nationality, as well the nasal note in his refined voice and his rather too ready assumption of the vast antiquity of all the European things around him. This was, indeed, no less a person than Mr. Grandison Chace, of Boston, an American traveller who had halted for a time in his American travels by taking a lease of the adjoining estate; a somewhat similar castle on a somewhat similar hill. He delighted in his old castle, and he regarded his friendly neighbour as a local antiquity of the same type. For Flambeau managed, as we have said, really to look retired in the sense of rooted. He might have grown there with his own vine and fig-tree for ages. He had resumed his real family name of Duroc; for the other title of “The Torch” had only been a title de guerre, like that under which such a man will often wage war on society. He was fond of his wife and family; he never went farther afield than was needed for a little shooting; and he seemed, to the American globe-trotter, the embodiment of that cult of a sunny respectability and a temperate luxury, which the American was wise enough to see and admire in the Mediterranean peoples. The rolling stone from the West was glad to rest for a moment on this rock in the South that had gathered so very much moss. But Mr. Chace had heard of Father Brown, and his tone faintly changed, as towards a celebrity. The interviewing instinct awoke, tactful but tense. 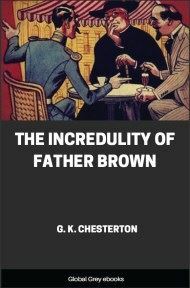 If he did try to draw Father Brown, as if he were a tooth, it was done with the most dexterous and painless American dentistry. They were sitting in a sort of partly unroofed outer court of the house, such as often forms the entrance to Spanish houses. It was dusk turning to dark; and as all that mountain air sharpens suddenly after sunset, a small stove stood on the flagstones, glowing with red eyes like a goblin, and painting a red pattern on the pavement; but scarcely a ray of it reached the lower bricks of the great bare, brown brick wall that went soaring up above them into the deep blue night. Flambeau’s big broad-shouldered figure and great moustaches, like sabres, could be traced dimly in the twilight, as he moved about, drawing dark wine from a great cask and handing it round. In his shadow, the priest looked very shrunken and small, as if huddled over the stove; but the American visitor leaned forward elegantly with his elbow on his knee and his fine pointed features in the full light; his eyes shone with inquisitive intelligence.